Part consoling sourcebook, part cultural commentary, part wry self-help manual, and part inspirational anthology, this gloriously uncynical handbook provides advice for creative workers struggling in a career world awash in bottom-line thinking. 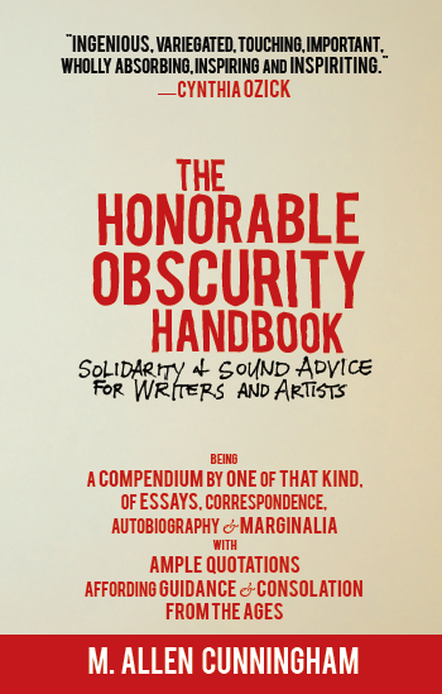 With an appealing blend of sound counsel, good humor, and vivid historical and literary anecdotes, M. Allen Cunningham offers solidarity to any writer or artist working against the grain of the times, and reminds us that obscurity, rather than being cause for shame, is a time-honored condition of the serious, committed artist. Readers will laugh aloud at the e-mails received by Henry David Thoreau's literary agent in response to his "bloated and incoherent" book Walden, and will underline and annotate the margins in such pieces as "In the Absence of Yes," Cunningham's bracing perspective on endless rejection. Hailed by Cynthia Ozick as "ingenious...important...inspiring and inspiriting," this unique handbook is unlike any volume on creativity you have read before. It is packed with insights -- both practical and philosophical -- that will appeal to every creative person you know. M. Allen Cunningham is the co-founder of the cultural commentary blog SoulShelter.com. His stories have appeared in many literary magazines including Glimmer Train and The Kenyon Review and have twice been nominated for the Pushcart Prize. He is the author of Date of Disappearance, The Flickering Page, The Green Age of Asher Witherow, Lost Son, and Partisans.